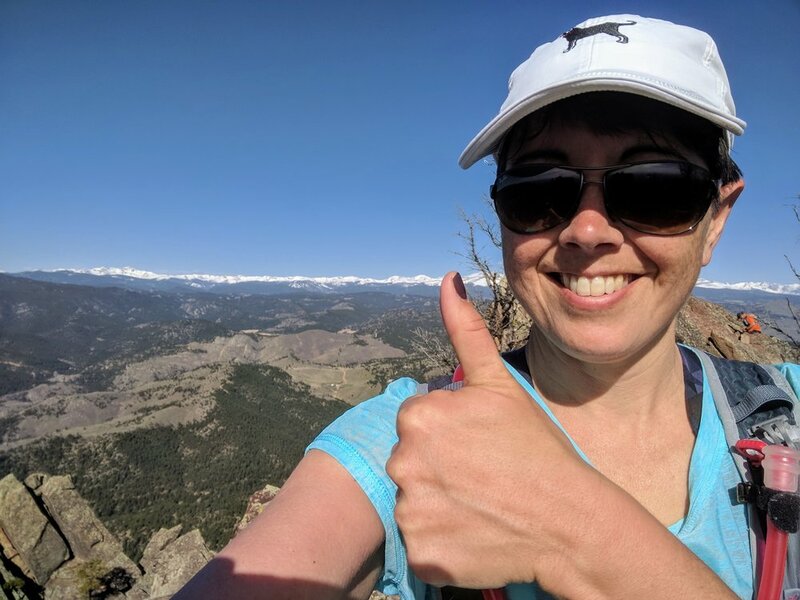 The criteria for this week's long run involved two factors: lots of climbing, and (because I knew I'd be running alone), enough other people on the trail to avoid wildlife encounters. It turns out, the perfect solution was just an hour away, in Boulder! 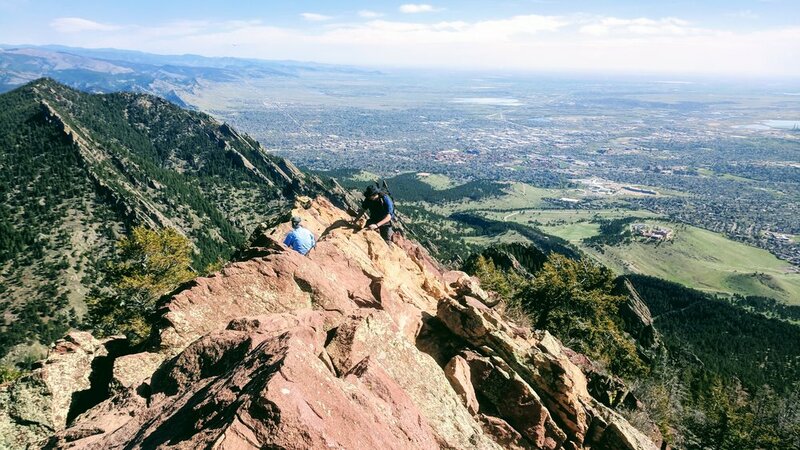 The Boulder Skyline Traverse is something of a tradition for Boulder-area trail runners (back in 2010 Anton Krupicka even wrote about it for Runner's World) but somehow I hadn't heard about it until last week as I sought out the perfect route for yesterday's long run. 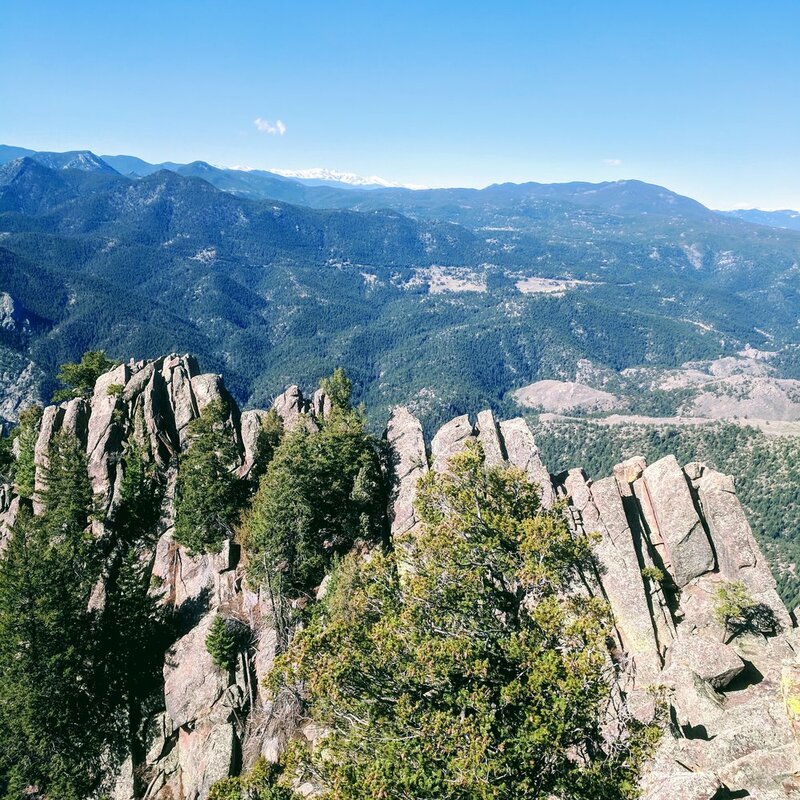 The route can be done north to south, or -- as I chose to tackle it yesterday -- south to north, and includes all the peaks that comprise Boulder's iconic natural skyline: South Boulder Peak (8,549'), Bear Peak (8,459'), Green Mountain (8,150'), Flagstaff Mountain (6,983'), and Mount Sanitas (6,843'). I'll describe the course and include photos of the run below, but if you're seeking an easily printable rundown, the Trail Run Project's post on the traverse is a great resource. Also, it's worth mentioning that almost all the trail junctions are well marked. I ran with a printout of turn-by-turn directions, but truly the only place where I had to consult a map was amid all the crazy trail junctions and road crossings of Flagstaff Mountain (and honestly, even there I probably would've found my way eventually.) If you're looking for a route that will give your climbing legs a great workout and showcase lots of gorgeous scenery not too far from town, the Traverse is a solid pick. I started from the South Mesa Trailhead, and made my way up the Mesa Trail for about 1.5 miles. Took a quick look back over my shoulder, downhill toward the trailhead. Amazing how green everything is right now! The Shadow Canyon Trail starts out like a wide, flat fire road, but after crossing the creek, turns into singletrack, and then to rocky scrambling, like this! From the mouth of the canyon, it's just one mile to the saddle... but 1,600' of climbing: one of the steepest climbs in Boulder. Most of the Shadow Canyon Trail is nicely forested, but the massive Flagstaff Fire in June 2012 left this area toward the top completely burned-out and open. Just beyond where I took this photo (at the trail junction at the saddle), turn left to head up South Boulder Peak. ...and the high peaks of the Continental Divide to the west (behind me in this photo). The view south is awesome too. I'm not particularly bothered by heights, but the drop-off from the summit is pretty extreme. Step carefully! 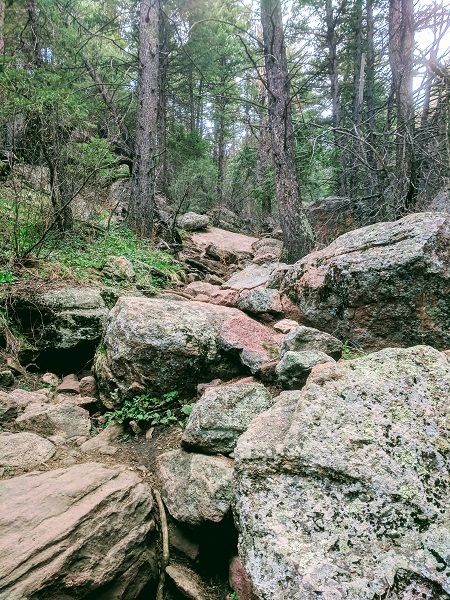 After tagging the summit, retrace your steps back down this rocky north flank of South Boulder Peak to the trail junction, and continue straight up a few rocky switchbacks toward Bear Peak. The Bear Peak summit (8,459') looking north. The Flatirons (seen from the side in this photo) and the rest of the Traverse all lie ahead! Two down, three to go! Another great view from Bear's summit, this time west toward the Continental Divide. ...which quickly give way to smooth, runnable singletrack (as seen here.) In retrospect, I might've pushed the pace a bit more through this section, but I ran pretty conservatively all day long, as this was my first time on these trails and I wanted to make sure I'd have the energy to make it up all five peaks. After a long descent, cross a creek, then after a few strides take a sharp left onto the Green-Bear trail. After some rolling, beautiful miles, the trail dead-ends at this perfectly framed mountain view, where you take a hard right to climb Green Mountain. Green Mountain's summit (8,150') was an absolute zoo when I arrived; it was 11 a.m. and it seemed everyone in Boulder was dragging their kids and their dogs to Green Mountain for Sunday lunch. But who am I to complain?! I picked these trails specifically because I would be running alone and didn't want to surprise any bears. So, mission accomplished! From Green Mountain's summit, backtrack south and west down the Green Mountain West Ridge Trail, then turn right on the Ranger Trail to go north toward Flagstaff Mountain. Continue straight as Ranger Trail melds into the Gregory Canyon trail, just before a short uphill, where you'll cross Flagstaff Road to the Realization Point Trailhead. This is a busy parking lot, with cars and strollers and dogs everywhere, so be alert! Just to the left of the metal gate in the parking area, go left (uphill) to take the Ute Trail. Continue on the Ute Trail as long as it keeps climbing, but to tag the unmarked summit, before Ute Trail starts to descend, head off-trail to the left to the highest point you can find (Trail Run Project helpfully referred to a "molar-shaped boulder" which did seem to be the highest point around). I snapped a photo here, but perhaps this was the wrong molar-shaped boulder? I've also come across some sources that say Flagstaff Mountain's summit is 6,983', and others stating 7,283'. ...and to the east, as you descend the Ute Trail, then the Flagstaff Trail. This is the only tricky place on the whole Traverse, navigation-wise, as there are so many bouldering trails cutting off in various directions as you descend. After crossing Flagstaff Summit Road, then Flagstaff Road four times, bear left at a marked trail junction, toward Panorama Point. This too is a busy parking lot, with lots of cars turning in and out -- be careful! Take the Viewpoint Trail north from the parking area; it descends a number of easy switchbacks into town. Because it was getting really hot at this point, and knowing that I'd soon be able to refill my pack at Eben G. Fine Park, I took some time on the descent to drink more water, to make the most of the coming refill opportunity. Looking north while descending on the Viewpoint Trail from Panorama Point. Soon, I'd be hiking right past the red rock formation in the center of this photo. When the Viewpoint Trail ends, turn right to go to the roundabout, then bear left to descend into Eben G. Fine Park. On this gorgeous Sunday, the park was full of cyclists cruising down the bike path, children playing on the playground, and people with inner tubes getting in and out of Boulder Creek. Bear left on the bike path to reach the restrooms. Cold running water here, and I happily refilled my pack. As you crest the hill and then descend into the Centennial Trailhead parking area, Mt. Sanitas will loom intimidatingly ahead of you. Yesterday I was so hot at this point; it felt great to have cold water in my pack as the sun beat down. Cross Sunshine Canyon Drive, aka Mapleton Avenue at this point, and bear left up the Mt. Sanitas Trail. Sanitas is never an easy climb, but I found it especially daunting as I started up yesterday, with the sun high in the sky, having already climbed about 4,700 feet that day. Sanitas has something for everyone, speedsters and mere mortals alike, and yesterday all the people of Boulder (and their kids, and their dogs) were on the trail as I headed up. For me, the bottom portion (with the huge steps) is the most painful... so, tired as I was, I just tried to keep putting one foot in front of the other and move upward. I think I inadvertently made the climb tougher on myself than it had to be, because I fell behind on my fueling. About halfway up, I started to feel dizzy and hot, so I stopped and sat on a shady rock for about ten minutes, and downed a gel and some water. I felt SO much better so quickly, that it made me realize I probably hadn't been taking in enough calories earlier. Revived, I set back out and up the trail... and before long, the radio tower came into view, and then with a final push, the summit! WHOO HOO! Mt. 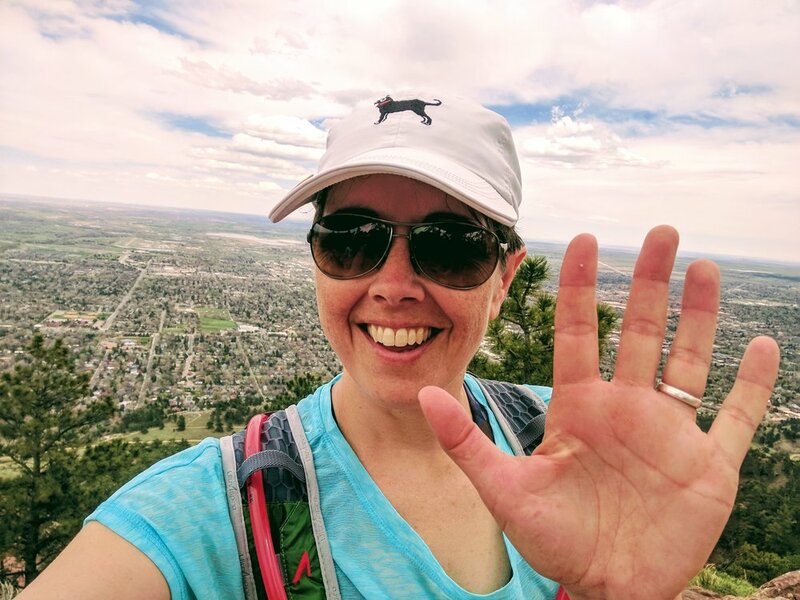 Sanitas, at 6,843', is the lowest of the five summits, but felt SO good to complete. I had plenty of company on Sanitas' summit. Looking south, toward the other peaks I climbed today. Nice view over Boulder, looking east. My Garmin's battery died just as I stumbled up onto the summit, so I don't have data for the descent, or for the walk I took into town, where I caught a Lyft back to the South Mesa Trailhead. My original plan was to run back through town, then to take Bluebell Road and the Mesa Trail back to my car... but as hot and hungry as I was, I cut the run short and got a ride. Between the 1.5-mile descent on the Mt. Sanitas Trail and the 0.7-mile jog from the trailhead to the shady neighborhood corner where I got a Lyft, I'm estimating yesterday's total mileage at 17.8 miles in about 7.5 hours. So how did it go? Well, my main goal was to get in a lot of climbing, and with 6,000+ feet of climbing, I feel pretty good about that. It has also been a couple of years since I last spent 7+ hours on my feet, so that was good too. I definitely have some training to do before I'll be truly ready for the Old Gabe 50k. That race has an 18-mile cutoff (at which point the cumulative climbing is 6,200') of 6.5 hours. Today I did close to 18 miles, and a little over 6,000 feet of climbing, in 7.5 hours -- a full hour over the cutoff. True, I stopped frequently to take photos, and I did a bit of running around at the top of Flagstaff looking for the summit, and I had that ten-minute pause on Sanitas to recover from bonking... but I'm not sure all that would add up to a full hour. The good news? The race is still 47 days away. Today's run was a solid effort, which will hopefully make me stronger. 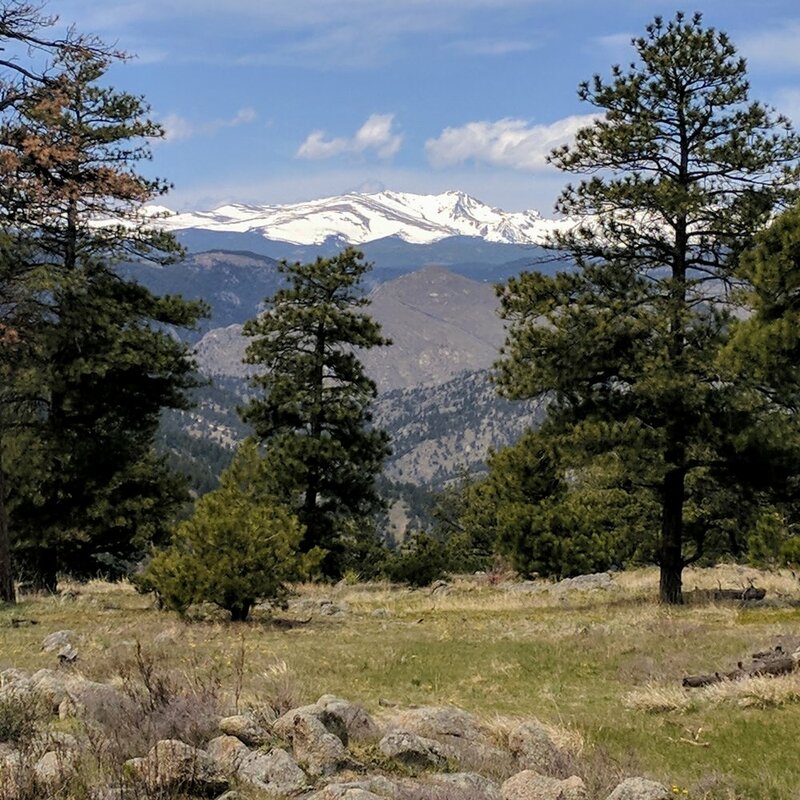 This week I'll have a recovery-length long run -- no more than three hours -- and I'll have a chance to get long runs in on May 12, May 19 and June 2. There's still some time to get stronger before race day. Wishing you beautiful views from whatever vantage point you choose, I'll see you on the trail!